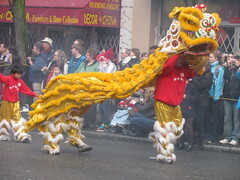 Lions were everywhere in Vancouver Chinatown, celebrating the Year of the Tiger. All the celebrities, politicians and VIP's walk at the beginning of the parade. 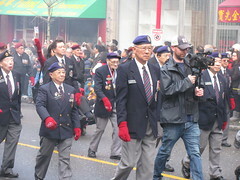 Next come the Chinese Canadian veterans of Pacific Unit 280 (minus my uncle Dan, who passed away less than a month ago). But the veterans all wore red Olympic mittens! 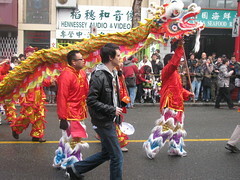 Here's a Chinese parade dragon. How to tell a dragon from a lion? You wear the lion costume over your body, while the dragon is always held up on poles! The Kitchen God always marches in the parade. The trick is to put honey on the Kitchen God's lips before he makes his report to heaven about your kitchen, so he can only say sweet things with honey on his lips. 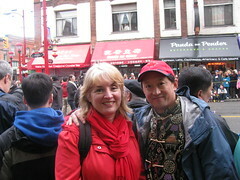 Here I am with my friend Georgia, who paddles with us on the Gung Haggis dragon boat team. The Carnival band all tried to dress up as Tigers…. City Councilor Kerry Jang hands out lucky red envelopes called “li-see” for good luck! Here I am dressed in my kilt and red Chinese dragon vest. 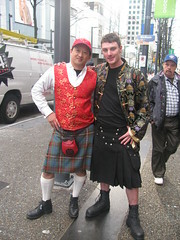 I met this fellow in his black utility kilt outside the skytrain stop at The Bay. Kilters greet each other, and I invited him to join us for the next kilts night. 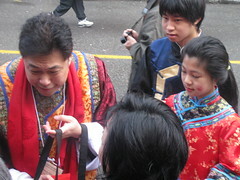 Since it was Chinese New Year we took a picture of him waring my Chinese jacket. Very cool. 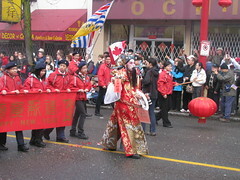 This entry was posted in Asian Canadian Cultural Events, Chinatown Vancouver, Cultural Fusion, Kilts - wearing kilts, Main Page, Multicultural events, Vancouver Heritage and History on February 16, 2010 by Todd. 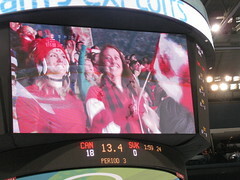 Canada 18 Slovakia 0 – Women's Hockey fills GM Place with red and white, and more red and white. It's a new Olympic record… 18 goals in a women's hockey game! Captain Haley Wickenheiser wins another face off. 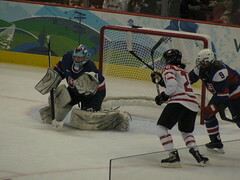 The Slovakian goalie faced over 50 shots, and stopped almost everything she had a clear shot on. During the 2nd and 3rd period, when it became obvious the score was heading towards 20-0, we started cheering for every save the Slovakian goalie made. 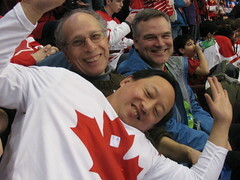 Here I am wearing the red maple leaf, with my friends Mel Lehan and Stuart Mackinnon! This entry was posted in Main Page on February 16, 2010 by Todd. 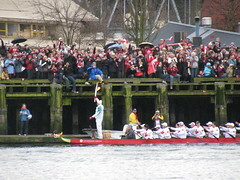 Vancouver 2010 Opening Ceremonies: What's wrong with this picture? I watched the opening ceremonies of the Vancouver 2010 Olympics, and something didn't sit right with me. Vancouver is always being touted as a multicultural city. It is the “most Asian” city in North America. It is the city with the most mixed-race relationships. 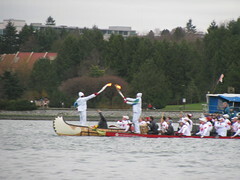 It was very nice to see a welcome from the Four Host Nations of Lil'Wat, Musqueam, Squamish, and Tseil-Waututh nations. Four totem poles were raised, and each host nation welcomed the world in their own language, followed by English and French. And then other First Nations groups from across Canada, were also recognized: from the North; the East; and the Prairies. It was a wonderful way to acknowledge and infuse First Nations culture into the Opening Ceremonies. It was an exciting moment to recognize and identify each of the flag carriers, as the Olympic flag was brought in. Donald Sutherland, Betty Fox, Barbara Ann Scott, Gilles Villaneuve, Bobby Orr, Julie Payette, Anne Murray and Gen. Romeo Dallaire. I was especially excited to see Betty Fox, because I have personally met her many times, as I have been a member of Terry's Team since 1993 – cancer survivors who speak at Terry Fox Runs and at schools. Then anticipation for the final torch bearer. A silouette of a man in a wheel chair! Yay! 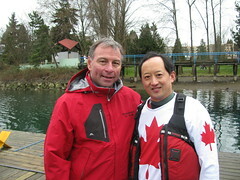 It is Rick Hansen – my favorite choice to be the lighter of the cauldron. Rick passes the flame to Catriona Le May Doan, who passes the flame to Wayne Gretzky, who passes the flame to Nancy Greene Raine. All four stand, as the caudron rises from the floor. All four light the cauldron together. Whoops, only 3 light the cauldron, because one pillar didn't rise out of the floor. Was this a sign? Was it a symbol? But, I also saw a lack of diversity in the flag carriers and final torch bearers. While recognize and admirer each of the chosen flag carriers and final torch bearers for their individual accomplishments and contributions to Canadian society. But…. if all the flag carriers, and final torch bearers had been male, we would hear women complaining. If all the flag carriers and final torch bearers had been Anglophone, then the Francophones would be complaining. And if all the flag carriers and final torch bearers were blonde, would brunettes, red heads and black haired people be complaining? Yes! 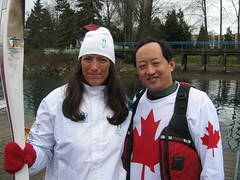 Part of the selling point for winning the Olympic bid, is that Vancouver is a multicultural city, and Canada's “Gateway to the Pacific.” Politicians and VANOC have been proudly telling the world that every athlete from every competing nation will find somebody in Vancouver that speaks their language, cooks their food and could welcome them to their home. And yes, David Suzuki, is a wonderful choice. He was the top living “Greatest Canadian” in the CBC show and #5 overall. Tommy Douglas was #1 (whose son-in-law was flag carrier Donald Sutherland) and Terry Fox was #2 (whose mother was Betty Fox, another flag carrier). Wayne Gretzky was #10. Romeo Dallaire was #16, Bobby Orr #19 and Rick Hansen #30. Chief Dan George was #80, Donovan Bailey #89, and Anne Murray #94. There are many past gold medalists that could have been included. Lori Fung (gold LA 1984 Rhythmic Gymnastics). Alwyn Morris (Gold & Bronze LA 1984 Kayak-pairs) who had held up an eagle feather on the podium, Donovan Bailey (Goldx2 Atlanta 1996 100m + 4X100 Relay), Daniel Igali (Gold Sydney 2000 Wrestling), Carol Huynh (Gold Beijing 2008 Wrestling), and Jerome Iginla (Gold Salt Lake City 2002 Hockey). Just the inclusion of one of these medalists, or all of them, passing the flame onto the final four would have been a tremendous inclusive moment. Remember that Sydney 2000 chose Cathy Freeman, an aboriginal to light the cauldron. Atlanta 96 had Muhammad Ali. VANOC opening ceremonies missed a chance to showcase the diversity of both Vancouver and Canada, and that we are just as proud of ALL our Canadians too! Maybe many people would have said “Who?” if Alwyn Morris had been holding an eagle feather in one hand, and a torch in the other, if he had walked into BC Place with the Olympic Flame – but it would have been both an educational and a proud moment for all Canadians. Morris is the first and only Canadian aboriginal to win an Olympic gold medal. It could have been a proper bookend to the inclusion of First Nations people – in how we have overcome Canada's racist history of residential schools and apartheid reservations, head tax and exclusion acts, internment camps and property confiscation – not how we still portray First Nations peoples as stereotypes in traditional costume, dancing and beating drums. This entry was posted in Main Page on February 14, 2010 by Todd. a brief interview between 8 and 9am.. I will do the interview at Robson Square, which is part of the the BC Canada Pavillion. filming at Chinese New Year parade with ZDF tv from Germany. 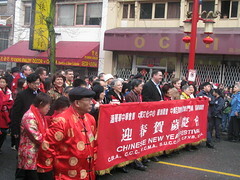 We will meet at 8:30am, as the parade starts at 9:30am in Vancouver Chinatown. 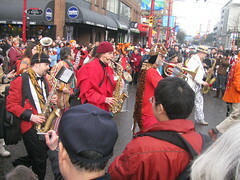 This entry was posted in Chinatown Vancouver, Main Page, Todd Wong, Upcoming Events, Vancouver Area Adventures on February 13, 2010 by Todd. If Terry Fox could light the Olympic caldron, would he? 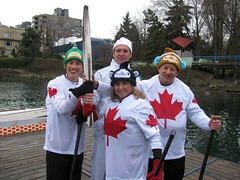 Who will light the Vancouver 2010 Olympic Caldron? The Spirit of Terry Fox? At the 1976 Montreal Olympics, the Olympic Caldron was lit by Stephane Prefontaine and Sandra Henderson, two teenage athletes. At the 1988 Winter Olympics in Calgary, the caldron was lit by Robyn Perry, a 12 year old figure skater. If this trend continues, it could be a baby lighting the flame in Vancouver's Opening Ceremonies. Maybe it will be the baby of figure skaters Jaime Sale and David Pelletier, as a “get-you-back” at the Olympic figure skating judges at Salt Lake City in 2002. But Canadians don't think like that… We aren't revengful, mean or spiteful. We are polite, sharing, compassionate and caring. We voted for Tommy Douglas as our Greatest Canadian. Terry Fox was number 2.
millions after he died. There are Terry Fox Runs all around the world. This entry was posted in Main Page on February 11, 2010 by Todd. 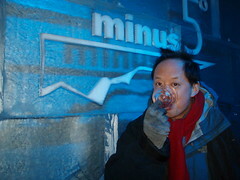 ice bar at Monk McQueen's Restaurant – VERY COOL! Bombardier street car – also quite cool. The street car follows historic street car tracks that are still in use for the summer. It travels from Olympic Village station, just West of Cambie Str. Bridge, and ends at Granville Island. Bridges Restaurant – mildly cool – but slow service – not cool! I have been to Bridges many times, but mostly during the mid-80's, then again after dragon boat practices in the late 90's and early 00's, so I know it well. It will now be a 2nd home to many of the Swiss athletes, and site of celebrations after medal ceremonies. 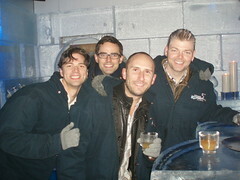 But we had the most fun at the Ice Bar!!! 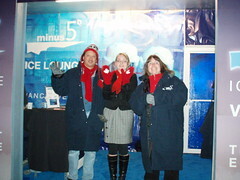 For $25, they give you a token for a special vodka martini, a parka and gloves to help keep you warm. The gloves are important because the cups being used are all made of ice! 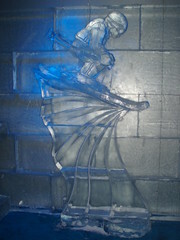 There are fantastic ice sculptures! 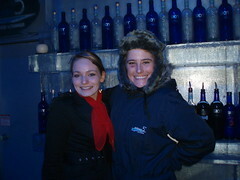 Our wonderful host Karlyn, and our bartender Jill. Jill has worked ice bars in Montreal, and is thrilled to be back in BC, as she is a Victoria native. She told us stories about working in the cold, and how it affects your physiology. She warned us about drinking our drinks quickly, because the alcohol can melt through your ice glass cup, if you are not careful. These Vancouverites were doing the same thing we were: checking out venues before the crowds! 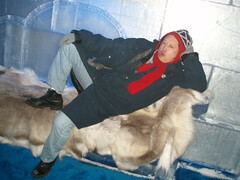 We tried to see if our tongues would stick to the ice sculptures. Not bad for my age… I think… but I could have flexed my pectoral muscles more. Jill thanked us for creating the highlight of the evening for her. It was a lot of fun. I have now declared Jill to be my favorite bartender in Vancouver! This entry was posted in Main Page on February 10, 2010 by Todd.